The rumors have been going around the web for some time now, but today AMD officially unveiled two new FX-series processors with clocks up to 5.0 Ghz out of the box. 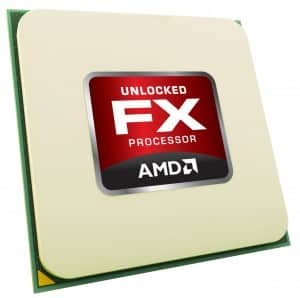 The new parts are based on the ubiquitous Piledriver x86 cores powering the latest generation of FX processors “Vishera” as well as FM2 socket A-Series APUs, and will be referred to as FX 9000-series CPUs. So far, two SKUs are planned to be released; the top dog being FX-9590 with eight cores running at a 5 GHz Max Turbo clock, followed by FX-9370 with a 4.7 GHz Max Turbo. AMD does not state at this time what the base clocks will be. The two new processors will come with unlocked multiplier for easy overclocking, as with all FX-Series models. The parts will first be made available to system integrators and there is no word on when, or if, they will reach the retail market. Furthermore, and although AMD did not detail the power aspect of these new parts, rumors are they will come with a TDP of more than 200 W.
So it looks like the bottom line will be...... "We made it... but you can't buy it." What the heck is the point of that? Heh, a lot of what AMD is doing these days seems to be more "hey, we're still here!" than anything else. Other than continuing to push the APU side, they don't have a new architecture ready on either the CPU or the GPU side and can't come up with anything new until they're finished. Without that, there's only so much you can do to stay in the public eye. I expect good things from them, especially on the GPU side when the time comes, but until then we'll unfortunately keep seeing stuff like this (for instance the "new" HD 7990 that had been out for months already). Wow. If AMD wants to bother putting the effort into making this thing and then doesn't even make it available, that's failing on a whole new level. If this is all hype over a CPU I can't even buy, it's hardly worth talking about and is one sad publicity stunt. Well, I don't think they're putting effort into making it, they're putting effort into binning it. There's no difference between this and an FX-8350 besides clockspeed and TDP. As far as I can tell, these are just the best of the best FX-8350s, with their model # changed. Heh, a lot of what AMD is doing these days seems to be more "hey, we're still here!" than anything else. Totally agree, which is odd and really is sort of unnecessary on their part when talking about this target market. The enthusiasts buying AMD still like me already get that we aren't trying to compete with Intel. AMD has been embraced the same way Lotus is in car circles- it's not about the raw performance numbers, it's enjoying a slightly quirky set of traits. This sort of thing just reminds everyone that they want to compete but aren't. I'd rather see a CPU that runs a base of 5GHz out of the box instead of just boosting to 5GHz, still neat I guess. My take on this is that AMD doesn't want to put this on store shelves as some (or most) motherboards won't support the stock power draw. They don't want to have problems with users dropping this in a budget board and the thing catches fire instantly. System integrators (or boutique PC builders, as Hokie puts it) will use these chips in high-end systems that use higher-end boards and water cooling anyway. It is funny seeing AMD ramp up the clock speed, but if they can do it then all the more power to them. It will be interesting to see how much going to 28nm will help with power conservation. The Jaguar apu is 28nm so Microsoft and Sony must have thought it was worthwhile enough to go with AMD this round. I agre 100%. Even the current 8350 has a huge thermal output when going over the 5.0 frequency. If anything the newer procs with possibly some process improvements should actually put out less heat at the same frequencies. The sample I have needs nearly 1.6v_core to be stable at 4.9. I'm fairly certain I could just throw one into the Sabretooth and be off and running. If I read the front page correctly, AMD has not stated the default speed yet so we have no idea what it will be only what the tuborcore with only half the cores on will be. If we actually ran the FX processors as designed, they would not run so hot. But being and doing as we do...well they are great current consumers and heat generators. Yes, that is correct; they haven't elaborated further. Hit them with the FEV!